Indian political cartoonist Aseem Trivedi, who was arrested and charged with sedition in 2012 before the charges were ultimately dropped, has warned in a new interview with the Australian Broadcasting Corporation that the state of free expression in his country has worsened during the intervening years. Mumbai police banned Trivedi’s blog Cartoons Against Corruption in 2011, and arrested the cartoonist himself in September 2012. 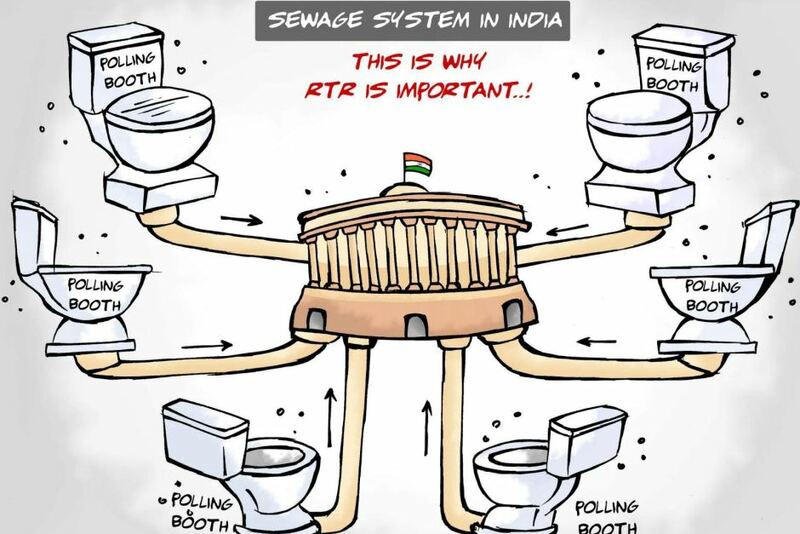 He was charged with sedition as well as “insult to national symbols, emblem, and parliament” for cartoons including the one shown here which likens India’s democracy to a “sewage system” feeding into the Parliament building. The sedition charge was dropped the following month, but the lesser “insult” charges were still pending as recently as November 2016, according to Vice News. Although Trivedi ultimately did not face trial for sedition, he did challenge his arrest on that charge and ultimately won an important victory for free expression before Bombay High Court, which ruled in 2015 that mere criticism of the government does not count as sedition–in order for the charge to be applicable, there must also be an incitement to violent revolt. Nevertheless, Trivedi said in the recent interview with Australia’s national broadcaster, Indian authorities continue to charge dissidents with sedition and shut down their social media accounts without justification. In India as in many other former British colonies worldwide, sedition laws are a vestige of colonialism that continue to be exploited by the current government in order to silence or at least intimidate critics. Trivedi and his supporters have been advocating for the complete repeal of India’s sedition laws since his arrest.